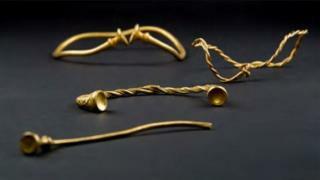 Jewellery that could be the oldest Iron Age gold found in Britain can be permanently displayed after £325,000 was raised to buy it. Three necklaces and a bracelet believed to be about 2,400 years old were discovered on Staffordshire farmland last year by two metal detectorists. The national Treasure Valuation Committee placed a value on the items. The items will be displayed at the Potteries Museum & Art Gallery, Stoke-on-Trent. The city council could not say when they would return to the museum but hoped arrangements could be made for them to come back at the start of next year. They attracted 21,000 visitors in a month earlier this year after being unveiled at the museum, but they are currently on display at The British Museum in London. The campaign began in September and last week grants of up to £165,000 from the National Heritage Memorial Fund and £80,000 from Art Fund took the total raised to its target. The items were thought to have been from the continent, possibly Germany or France, and "important women in society" would have worn them, the council said. Mark Hambleton, who went back to metal detecting after advice from his late father, discovered the artefacts with Joe Kania in Leekfrith last December. Their find was declared treasure at an inquest led by coroner Ian Smith, who joked it was likely to be "worth a bob or two". The museum friends said as well as major grants, they were "thrilled to receive many generous donations from individuals and groups".